Now we have our new fly. It’s two weeks later. there haven’t been any significant storms since the last time you went and a nice weather window comes up with similar tides. Nobody has been bothering those fish that you know about, and the area hasn’t been worked by gill nets for a while (something we always have to worry about in NC unfortunately). Those fish should still be there. You and your buddy get out there again. This time he gets the bow first and you graciously offer him one of your new flies. He graciously accepts. On the way out to the flat you really are hoping the fish are still there. You shut down and start poling. Of course you start poling far enough away that you don’t spook the fish. You would never run right up onto a flat. That’s just rude. You’d spook the fish and possibly ruin the flat for yourself and any future endeavors. Also it messes up any grass growing there. After poling for about 15 minutes you see what you were looking for… the school shows up as a black blob moving across the bottom. You head that way. The wind is blowing lightly from left to right and the sun is behind you, a perfect set up. 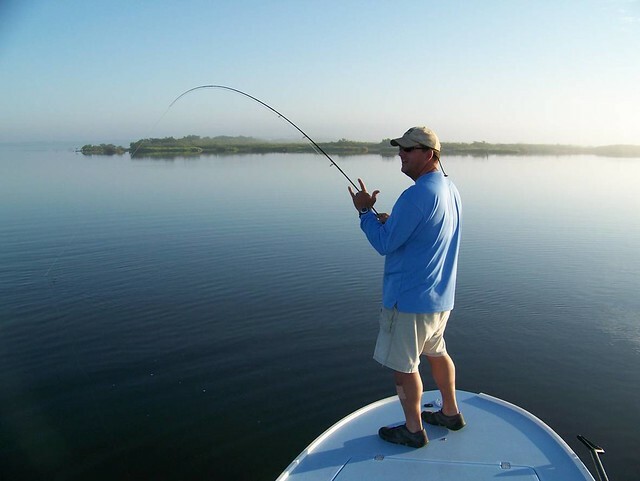 Your buddy is within range and makes a perfect 80 foot cast. The fly lands about 5 feet in front of the lead fish in the school and they are moving right towards it. You’re getting pumped now. Suddenly two fish near the front accelerate rapidly, you see a wake as they rush towards the fly. They are competing over who gets it! The bigger fish gets there, tips down, flares its gills, opens its mouth and the fly is gone. You buddy strips his line to come tight and the fight is on. Your new fly is a success!. 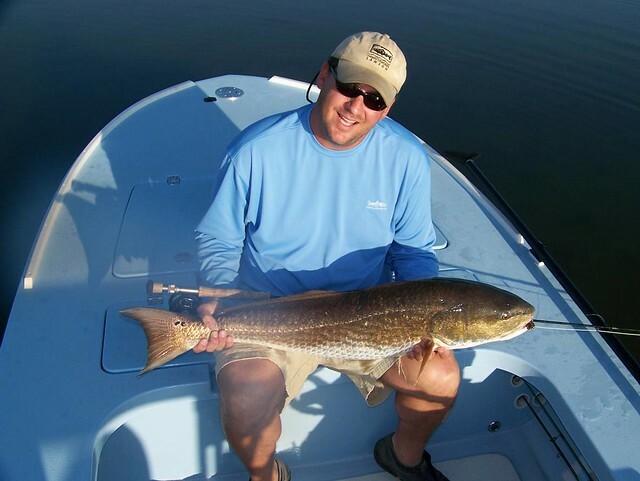 The redfish is near 30 inches long and makes a nice long run into the backing after the hook up. You pole the boat away from the school so as not to spook the rest of them. The fish stubbornly comes to the boat after a couple more runs. Lights, camera, release. Switch places and after it again. It’s a beautiful day filled with beautiful fish, made all the more perfect because you figured out the solution to a vexing problem. That’s what flyfishing is all about. What it looks like when you hook a big one. This is what the big one looks like.